What Could Have Prevented This Dark Day for RadioShack? According to reports, RadioShack is discussing closing their doors for good. I am by no means a connoisseur of electronics or the best place to purchase them. I generally go to Best Buy because I know they'll have what I'm looking for and the prices will be fair. There is a RadioShack only a few blocks from my house, I pass it daily. (This particular RadioShack has a special claim to fame.) I watched two people walk into it recently and wondered aloud, “why are those people going in there?” The surprise to me isn’t that RadioShack is closing; it’s that it lasted as long as it did. From a digital marketers eye, what could RadioShack have done differently? Was RadioShack so set in its ways that it couldn’t see that people flock to big box stores in the suburbs, unless they’re Manhattanites and stuck in the city. I live in the inner city of Denver and still drive 20 miles to get to Ikea, or for that matter, about five miles to get to Best Buy. Was RadioShack too scared off by the demise of Circuit City to try their hand in that space? Were they just so set in their ways that they wouldn’t change? Best Buy has had its troubles too thanks to sites like Amazon, but Best Buy has fought back with an online presence. They also have convenient interest free payment deals which makes them desirable to some demographics. Could RadioShack not foresee the demise of even big box retailers and make the jump to an exclusively tech based Amazon? For whatever reason, the RadioShack near my house looks like it did in the 1980s and in a world that retired the Space Shuttle, certainly a static store like RadioShack, which which was soaring to its greatest heights in the same era, didn’t stand a chance. In digital marketing, if you are not looking forward then you are already behind. We have to assume that everything that is relevant today will be obsolete in six months. We can't allow our agencies and departments turn into relics the way RadioShack did. RadioShack did try to rebrand. First they became RadioShack (they were Radio Shack), then The Shack. The most prevalent name change that pops into my head is Kentucky Fried Chicken to KFC. That change made sense because people called Kentucky Fried Chicken KFC, they recognized that the rest of the world already branded them differently and they contemporized. 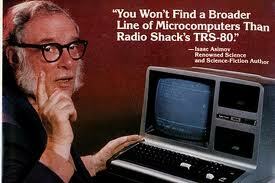 No one called RadioShack The Shack, the name was being forced on us. When I think of something called The Shack, I think of a place to buy fried seafood, not electronics. If RadioShack could not evolve from what it was into a big box or online retailer, the least they could have done is maintain their dignity and keep the household name they’d used since 1921 (not counting the brief stint as Tandy Radio Shack & Leather). I wrote an article last week on the branding. The brand is the single most important thing a company has. Every facet of marketing is built around the brand. Once the brand is established, it's better to work around the brand than try to reinvent the brand to what you want your company to identify with. When I think of a RadioShack ad I think of a Sunday newspaper in 1987. I do know that if I ever needed a radio controlled car, RadioShack was my place, that’s about how old I was when I last recognized a RadioShack ad. While that's what stands out when I think of their ad campaigns, they must have had a robust campaign at one time. RadioShack actually had a great Super Bowl commercial last year in which they gave their store back to the 1980s and reinvented themselves. They made fun of their perception and had a ton of nostalgia, it was about as good as a commercial gets. It was just too little too late. No one honestly believed that RadioShack had morphed into a contemporary store overnight. For the first time ever, so that I could properly write this blog, I went to RadioShack's website. I wasn't dismayed by it but there were some inherent flaws that no major corporation, or non-major corporation should make. Their blog for example seems to be housed under a different site. Once you get to it, as far as I can tell, it’s not possible to navigate back to the homepage. Also the blog, which is something that I, as the curator of Revenue River’s blog, am critical of is that the content doesn’t come out often enough. According to their About TechSpecs (the name of the blog) page, they have an almost infinite resource pool to choose from to write for them, yet they’ll let a week lapse between posts. Their latest “most popular” article is from November 2013. Their copyright still says 2013 on their blog. Their homepage copyright still says 2014, yet we’re a month into 2015. This isn't just unprofessional, it shows that they just gave up. Likely they did and the people largely responsible for the site are long gone. I’m not a CEO in a corner office. I did not go to business school and while I understand terms like LIBOR, EBIDTA and Sarbanes-Oxley, I'd be lost in a practical conversation that includes them. There were very intelligent people working at RadioShack, they had ideas, they tried things. For one reason or another they didn’t try the right things. RadioShack should have paid attention to one of their contemporaries from the 1980s, Back to the Future II. Perhaps they’d have seen a world that was far too modern for the relics of only 30 years past and they’d have done more to keep up with the times. Revenue River often times will publish posts from guest authors who are either looking to start a career in the inbound marketing field or have valuable expert insight from experience within different areas of the industry. To learn more about a specific guest author, look for a short bio at the bottom of every article written.